I received product for review from Ravensburger. The opinions within this post are of my own and I was not influenced in any way. Please do your own research before purchasing products or using services. Your opinions and results may differ. Emma, our 13 year-old, is quite content with craft and art kits. She likes spending time working on a projects and seeing it come to life. When the end result is satisfactory, she's one happy girl and is quite proud to show off her work. 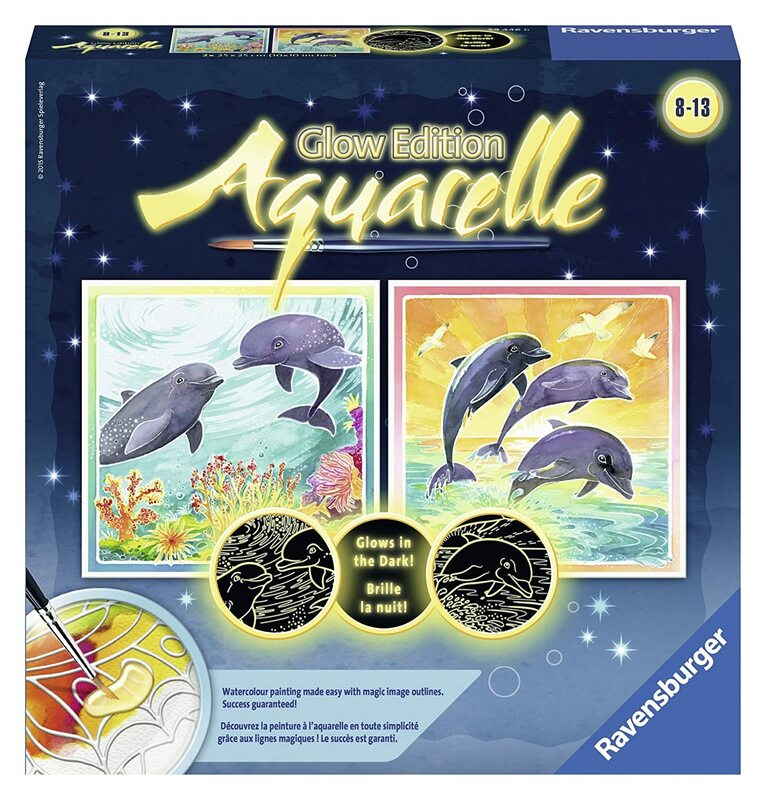 Recently Emma worked on the Aquarelle® Glow: Dolphins arts & crafts Kit from Ravensburger. 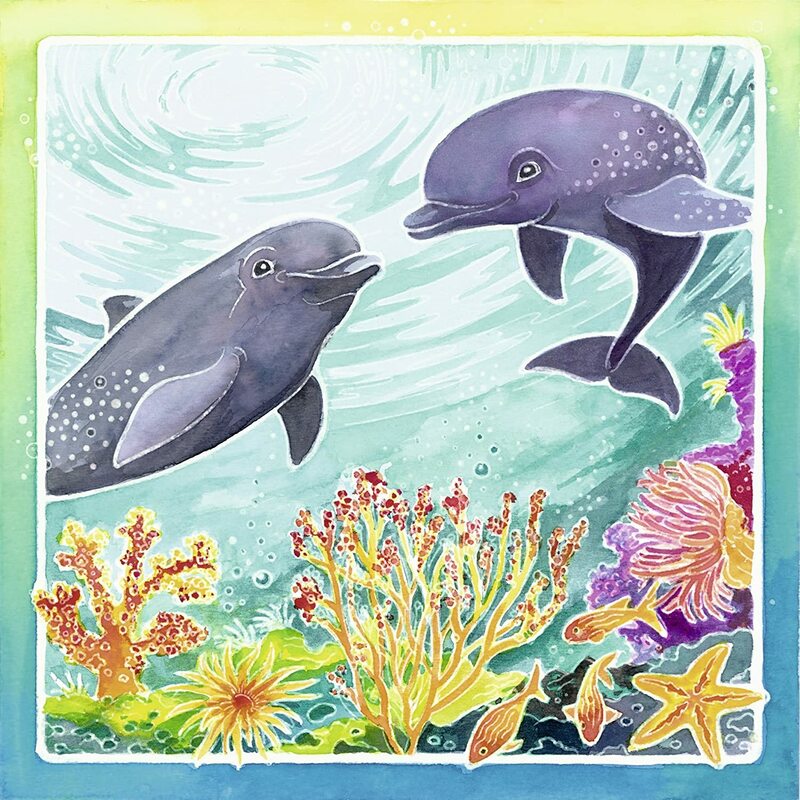 It is a glow-in-the dark paint kit with two canvasses of dolphins, and each canvas is 10" x 10". Included in the paint kit are the two canvasses, five liquid watercolor paint bottles, one double-sided paintbrush, one water pipette, one color-mixing palette, and set of instructions. This paint kit is geared towards the 8-13 age range. I think it's appropriate for the tweens and teens. Although it's not real hard to complete, it does take some method and patience. When first starting out, the canvasses are white with faint outline. The scenes are outlined with thin, wax lines to guide the work and prevent paint from running. It does require good lighting to see the outlines. Emma created the scenes by following the color guide and placing paint in in the palette. The two finished canvasses were real similar in look to what is shown on the box. Emma is proud of her artwork and has it displayed in her room. What makes it pop out even more is that they glow-in-the-dark, giving an added effect. 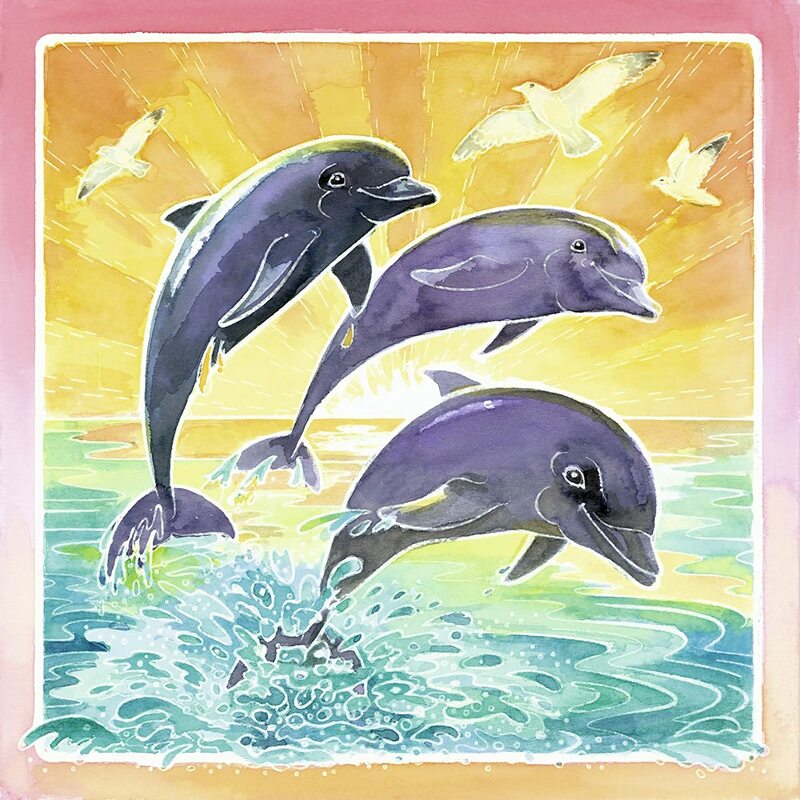 One person will win a Aquarelle® Glow: Dolphins - Arts & Crafts Kit. I too love dolphins, but I also sea turtles! I like starfish. Those regenerative properties are just amazing. I think sea animals, seals, dolphins and so many more! I love Dolphins! When we use to go out on the boat, dolphins would always swim beside our boat. They are so beautiful! I love dolphins and sea turtles! We love sharks. My son has a collection of shark items and books. Dolphins are my favorite sea creature. I love so many of them. Dolphins are probably my favorite though. I like sea turtles. I saw them in the wild in Hawaii. I love dolphins and whales! That's tough I really like all ocean animals, maybe dolphins, whales or jellyfish. My daughter loves dolphins so I would like dolphins. I also like Whales. id have to say whales, they r beautiful and smart. My favorite are sea turtles. We love dolphins they are so smart an amazing! All are pretty but my favorites are dolphins, porpoises. I love seahorses. Thank you for the giveaway! I really love Dolphins, & enjoy watching them! Beluga whales have always been my favorite. I love starfish and jelly fish! I'm from Maryland so I love the blue crabs. I like whales. They are so majestic. I have always loved dolphins! Thanks for the chance! my daughter would like dolphins. My favorite sea animal is the whale. I really like Sea Turtles. I heart a sea horse. Go Dolphins #1, Sea turtles come in second. I don like dolphins alot. I love seahorses! My grandma loved them, and I am carrying on the tradition. My favorite ocean creatures are whales. I love starfish. Thanks for the chance to win! Dolphins are my favorite sea creature so this would be awesome to win! My favorite is the star fish, I think that they are so neat! I love dolphins and the occasional starfish or two. I like seals! Thanks so much for the chances to win. I like the Starfish the most of all of the creatures in the Ocean.